I’m a bit late to the game on the ras el hanout front. This ingredient has always seemed a bit too ‘Yotam Ottolenghi’ for me (meaning that it can’t be found easily in suburban Nottingham). But Tesco now stock it in their own brand spice range – a sure sign that it has entered the realms of commonplace. Anyway, my sister gave me a little bag of it to try recently and so I set about finding a recipe. Ras el hanout is a North African spice mix which translates as ‘head of the shop’ – as in the best spices the shop keeper has to offer. I have no idea exactly what was in my little unmarked bag, but according to Wikipedia, cardamom, cumin, cloves, cinnamon, nutmeg, mace, allspice, dried ginger, chili peppers, coriander seed, peppercorn and paprika are all commonly used. I’m not sure why this recipe (a bastardised version of one of Jamie Oliver’s*) uses additional cinnamon, cumin, paprika and ginger if the ras el hanout is likely to include these already. Purists would probably insist of making up their own spice mix from scratch in any case, as with garam masala, curry powder, jerk seasoning, five spice and the like. All I can say is that the final dish was delicious and very easy (if time consuming) to make. When I was frying off the beef my son asked me if I was making mince pies. I can see why he said this because the cloves, cinnamon and nutmeg in the spice mix does make it smell very Christmassy. I’m being a complete Grinch about Christmas at the moment so this is probably about as festive as my recipes on this blog will get this year. *the original recipe can’t be trusted in any case. The comments section on Jamie’s website bought my attention to the fact that he uses teaspoons of spices in the TV series but tablespoons on the web. Place the beef in a bowl with all the marinade ingredients and mix them in with a wooden spoon or massage them in with your hands. Cover and place in the fridge for 12-24 hours. When you are ready to cook, heat a little oil in a frying pan over a high heat and brown the meat all over. It is worth taking the time to make sure you get a really good dark brown colour on both sides as this helps with the final flavour. You will probably need to do this in a couple of batches depending on the size of your frying pan. Fry off the onion in the same pan until brown. Place the beef and onion in a lidded casserole dish along with the can of tomatoes, apricots, chickpeas and stock pot/cube. Cover with 1 and a half tins of water (using the tin from either the tomatoes or chickpeas to measure). Bring the mixture to the boil on the hob and then cover. Place in an oven preheated to 180oC for 1 hour. Then reduce the temperature to 150oc and cook for a further 2 hours or until the meat is tender. Make sure to check the pot at regular intervals (about every 30 mins) to give it a little stir and add a little extra water if the sauce is becoming too dry. Just before serving mix in a good handful of chopped, fresh coriander. Serve over a steaming bowl of cous cous or rice and garnish with more coriander and lightly toasted flaked almonds. PS. If, unlike me, you are feeling the yuletide spirit then you may like to try one of my Christmas recipes from previous years. ‘Happy Days with the Naked Chef’ has to be the world’s most annoying cook book. It sums up everything I hate about the cult of the TV chef. It screams “look at me, don’t you wish you were me?” Look, here’s me and my misses all loved up, and look here are all my cool mates. It is also condescending in the extreme. It tells you how to make a fish finger sandwich for goodness sake, and then, just to be super annoying, it finishes with diet tips under the heading ‘You are what you eat’. Having said all this, I do think that Jamie Oliver writes some good everyday recipes and this one is just brilliant. It’s also the reason why ‘Happy Days’ has been saved from the charity shop pile on several occasions – despite my husband’s objections (he just can’t stand the way Jamie’s smug photo on the spine follows him around the kitchen). When I see fresh fennel in the greengrocers I immediately dream of this dish and unusually for a tomato based pasta dish it doesn’t require any cheese on top so it’s great if you’re cooking for someone who’s dairy intolerant. Heat a tablespoon of olive oil in a frying pan over a medium heat. Add the salami, sliced garlic and fennel seeds and cook for about a minute until the oil starts to run out of the salami and it begins to crisp. Add the sliced fennel and cook for another 5 minutes or so until the fennel begins to soften. Now add the tinned tomatoes, turn the heat down to a gentle simmer and cook for 25 minutes without a lid until the sauce has thickened. Season with salt and pepper to taste. Cook your pasta in boiling salted until just soft. While the pasta is cooking and the sauce is simmering make the crunchy breadcrumbs (Jamie calls these pangritata). Take a thick slice of bread (white or brown both work well and you can even use the crust end if that’s all you have). Chop the bread into small cubes with a knife or you can make coarse breadcrumbs with a food processor. Heat a couple of tablespoons of olive oil in a small frying pan over a highish heat and fry the breadcrumbs until they are golden. If you like you can also add a sprig of rosemary to the pan to flavour the oil and the breadcrumbs (you will need to discard this at the end). 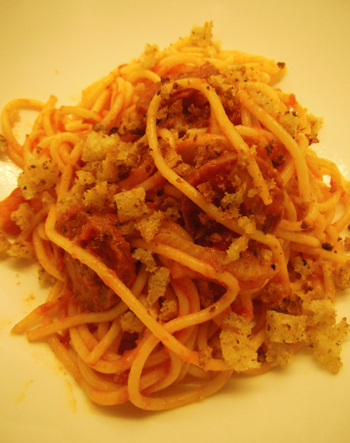 When the pasta is done toss it with the tomato sauce and sprinkle the crunchy breadcrumbs on top. When I was bought my beloved pasta machine Jamie Oliver had just published ‘The Return of the Naked Chef’ which had a whole section on making your own pasta. Keen to learn the art, I bought a copy of his book and was horrified to find that his ‘blinding pasta recipe’ used 4 whole eggs and no less than 8 egg yolks to serve just 4 people. Did the man not realise the price of eggs and how much the recipe would cost his readers to make? Undeterred, I managed to find this more economical recipe in an old Marks and Spencer’s Italian Cookery book published in 1979. It works just fine for me and I have been using it happily for 13 years. The great thing about home-made pasta is that although it takes a little time to make it takes hardly any time at all to cook – just 1-2 minutes. It may seem like a lot of faffing about, and I’m sure pasta machines often appear on those lists of useless kitchen gadgets, but it’s so rewarding to make your own pasta from scratch and it really is delicious. 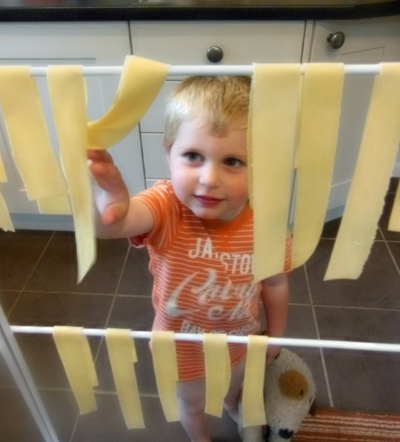 This recipe does require a pasta machine to roll out (you probably could do it with a rolling pin but that sounds like really hard work to me). I have an Imperia Pasta Maker with a spaghetti attachment which my sister bought me from Italy (but you can buy them here from John Lewis). It’s very well made and still going strong after lots of use. *Until very recently I always just used plain flour (the original recipe doesn’t specify) and I was always happy with the results. Recently though I have been splashing out and buying ‘00’ flour as McDougalls now do this for a reasonable price. I think there is a small difference in that the pasta holds its shape better when boiled. Put all of the above ingredients in a bowl and mix together with your hands until it comes together in a ball. Lightly flour your work surface and knead the dough for a few minutes until smooth. 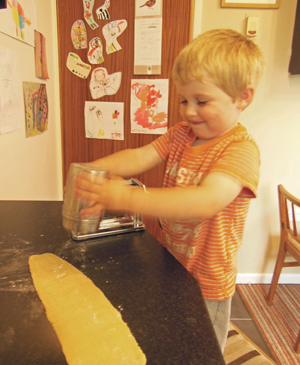 Kneading pasta dough is much harder work than kneading bread dough. I think most recipes advise kneading for longer than I manage, usually about 3 minutes. Wrap the dough in cling film and leave to rest in the fridge for at least half an hour. Now for the fun bit. 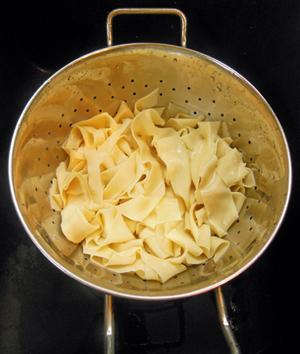 Clamp your pasta machine to your work surface and set the machine to its thickest setting. 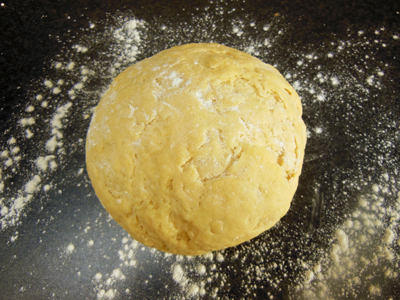 Divide your dough into four and working with one ball at a time (keeping the others covered with the cling film so they don’t dry out) start by flattening the ball a little with your hands and then running through the machine. If the dough starts to crack a little (this often happens to me as I don’t knead for long enough) don’t worry, just fold the piece in two and run through the machine again until it softens up a bit, you may need to do this several times. Once smooth keep rolling the piece through the machine changing for thinner and thinner settings until you have the thickness you need for the type of pasta you want to make (see below for advice on this). It helps to dust the sheet lightly with flour each time you roll it through. Rolling out using child labour. I use a clothes drying rack to hold the sheets while I repeat the process with the other three balls. When I first got my pasta machine I can remember finding the rolling out rather tricky, it felt like I needed a third hand. But it didn’t take long to get the hang of it. 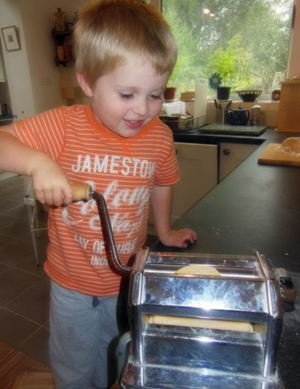 My children absolutely love helping to roll out the pasta however it does take three times as long and a fair few arguments about whose turn it is to turn the handle. And again, 2 and a half years later. Use the thinnest thickness setting when rolling out. You will need to cut and trim the sheets to fit your oven dish. I usually do this once the pasta is cooked as the sheets expand slightly. For hand cut tagliatele I use the thinnest thickness setting when rolling out with the machine. I then lay the sheets on a floured bread board and cut into strips with a knife about an inch thick but you don’t need to be exact. This gives a rustic feel but it does take a while. This is quicker than the above method, again use the thinnest thickness setting. Then flour the pasta sheets before passing through the thicker side of the machine’s cutter which makes strips 1/2 cm thick. For noodles I use the second to last thickness setting when rolling out and then cut with the thinner side of the machine’s cutter. Once the pasta is cut into the desired shape simply cook in a large pan of boiling water for 1-2 minutes or until cooked. If the pasta has been left to dry out for a while on the rack then it may need longer. A good tip if you want to precook your pasta for use later is to immerse it in a bowl of iced water immediately after boiling and draining. This is great for fried noddle dishes where the noodles are best added cold. Once completely cool you can also then drain the noodles and toss in a little oil. 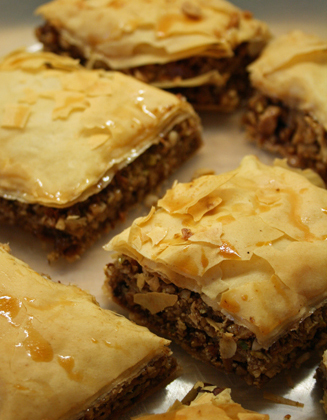 They will then keep in the fridge for a few days or until you are ready to use. For me the perfect sauce to accompany home-made pasta is a good pesto. See my post ‘Things in jars – pickling and pesto’ for a couple of recipes. Other good uses are Pad Thai (noodles) and a meaty Ragu (tagliatele). Recipes for these will appear on this blog soon.